Love playing as a team with up to 6 of your friends? Escape Land is a escape room in which you have to escape from within 60 minutes. Fight through a maze of puzzles and mysteries which will eventually lead you to opening to door to exit, well that is if you solve them all within 60 minutes. The rooms are designed to challenge your mind, creativity and logic, you will need to work together with your team to get out in time. Using and combining the objects that can be found inside the room which takes skill and thinking from all. They have two rooms which you can play from Professor Oxford’s Experiments and Da Vinci’s Exploration. You will be locked in to the Mad Proffesor’s house and you travel back 100 years in time. During the game you need to meet with the Professor and use his time travelling machine to come back to the present. This escape room is based on Escape Land’s original game: Escape from the Age of Steampunk. There are a lot of similarities between these two escape games, please only book if none of the players in the team has played that room in the past. Just a few people know, that Leonardo Da Vinci was part of a secret organisation guarding the holy grail. You need to find the grail and use it as a magical key on the right door, it will then grant you a long and happy life, if you believe in it. The road to the key won’t be easy, because evil forces are working on finding the key as well, they are planning on destroying it. Da Vinci set up different obstacles and challenges on the way to the holy grail to keep unworthy people from finding it. The enemy needs 60 minutes to get to it, are you faster than them? The quest is based on Da Vinci’s life. This escape game requires players to work as a team to solve hidden puzzles, look for clues and to try to escape in an hour. The room gives to the players the opportunity to use their knowledge, teamwork skills to accomplish a unique escape game. There rooms are certainly the most ideal escape games for team building, game enthusiasts, friends & families. Thanks to Escape Games London who let some of the community of Love Pop Ups London come down to play and solve the mystery of Da Vinci. Read all blogs/reviews from the comment section below. This was defiantly the holy grail of escape rooms, quite possibly one of the best i have done so far. It has a good mix of puzzles and searching for hidden keys or clues, and they helped you out if you needed it. Great for a small team of around 5 or 6 as you can split up and concentrate on different things, its not a linear game so you can solve bits in differnt orders. The theme inside the room has been very well throught out and there is a good level of attention to detail dotted around. I would definitely do mad scientist room now as i can only image its just as good as the Di Vinci Code! We started in a relatively small, very dark room and immediately set to task. There are plenty of puzzles and locks in the first room, so all five of us had enough to do. The puzzles don’t necessarily follow a sequential storyline arrangement, but they all make sense and fit within the Da Vinci setting. I’ve done quite a few escape rooms so I was very impressed by the overall construction of this particular escape room. Before the start of the game we were sat in the waiting room with multiple wooden and metal brain teasers. This gave me an indication that the game makers behind this genius room really thought of clever mechanisms that challenges the brain and logic. Without giving away spoilers, I find that the best escape rooms are ones that follow a strong storyline and transforms and convinces you that you’re in another place. Like a movie set or stage. I felt I was really in touch with the theme of this game and there was enough activities to involve the whole group whilst being easy enough to follow but with some challenges along the way. This game encourages the team to communicate and work together otherwise it’ll delay the overall performance and time in getting out. It’s a really well made room and this is definitely one to try as it involves something that I’ve never seen before in an escape room. Starting with the props, to the person and the puzzles, it was all good! I entered to find a really cool foyer with a map wall, fun props and simple puzzles inspired by Da Vinci’s inventions which you can play with. I quite liked that you can start with those to mentally get ready while you wait. The person who worked there was very nice and answered all our questions with a smile. He introduced us to the game in which we would be finding the Holy Grail by solving puzzles set up by ‘Da Vinci’ himself. The puzzles were really inventive and I won’t spoil it, but one moment in the game feels like magic. I have done a bunch of the escape games in London, but the challenges in this one felt fresh and fun and there was some real originality. I found the room challenges to be fairly straightforward and clear and the Da Vinci theme was well-done. We only asked for one hint and finished with 11 minutes to spare, so I think the difficulty level was perfect for us. I particularly liked the physical games just because they were quite fun, but all of them were good and there was a fair amount of all types of puzzles. Love Popups London gave me the opportunity to try this game and I definitely got lucky, it was one of the best in London that I have tried! The production values were excellent and the problems were varied and fun to solve. I would definitely recommend this game! Hidden at the Tottenham Court Road end of Oxford Street you will find this escape room. The waiting room is full of fun things to interact with as you wait for your allotted time. My 4 friends and I went in to see if we could crack DaVinci’s code and escape with the Holy Grail. My first EVER escape room and boy, why an escape room it was! Puzzles, locks and mind boggling challenges, it was action packed from the very beginning! I love the torches and the sense of mystery.. I highly recommend checking out this place if you’re in town, it will be one of the best hours you’ll spend! If you like locks, logical thinking, intriguing puzzles and an element of surprise then this is the game for you. The Da Vinci theme was set perfectly and carried on throughout the whole experience. It had a nice mix of tasks and puzzle pieces some of which I have not seen before, helped add to the wow factor to the room. Definitely one to keep you on your toes and does require you to think carefully as sometimes the solution is not always obvious and requires deeper thinking. I felt the atmosphere and the story of the room worked well together and if you around and looking for a room with a bit of something different then I would try this out. A very good and complete escape room company! I have now played both of their rooms: Professor Oxford’s Experiments and Da Vinci’s Exploration and trully enjoyed both of them. Professor Oxford’s Experiments is a more traditiona; escape room even though some of the puzzles are quite creative and quircky. You will have to travel in time and work your way back to the present in order to escape. Da Vinci’s Exploration was my favourite of the 2 rooms. Exploration is actually the perfect word to describe this game. The room is set-up just like you are on an adventure and your mission is to find the Holy Grail. It’s full of really intersting puzzles to solve and full of surprises. This game is worth every penny and it will definitely keep you on edge! A must do if you are an escape room addict and want something a little bit different. Though this escape room is more traditionally set out compared to their other game, there’s still elements within that you wouldn’t find in other escape rooms. The innovative puzzles and the effort gone into setting this apart from other companies is clear. So not only are you solving puzzles but you’re also wrapped up in the storyline and those combined makes the games designed by Escape Land both fun and challenging and having these makes the game more memorable. ‘Team work makes the dream work..’ And for this escape game.. This quote means everything… Want to know more.. Check out my review below. Back down to the hidden gem of Oxford Circus. This time to try to escape Professor X’s room. Five of us entered the room and immediately saw things to do. I did Da Vinci’s Exploration room and from the moment the door closed until the 60th Minute (as we just about completed It on the cusp!) I was totally engaged with so many interactive puzzles/clues and places to look see and do and sounds playing in each room (great if you have a minimum team of 4 or more I recommend) this has to be up there with many other escape rooms I’ve done recently as I do like very interactive rooms, you won’t be disappointed with this Escape Room. 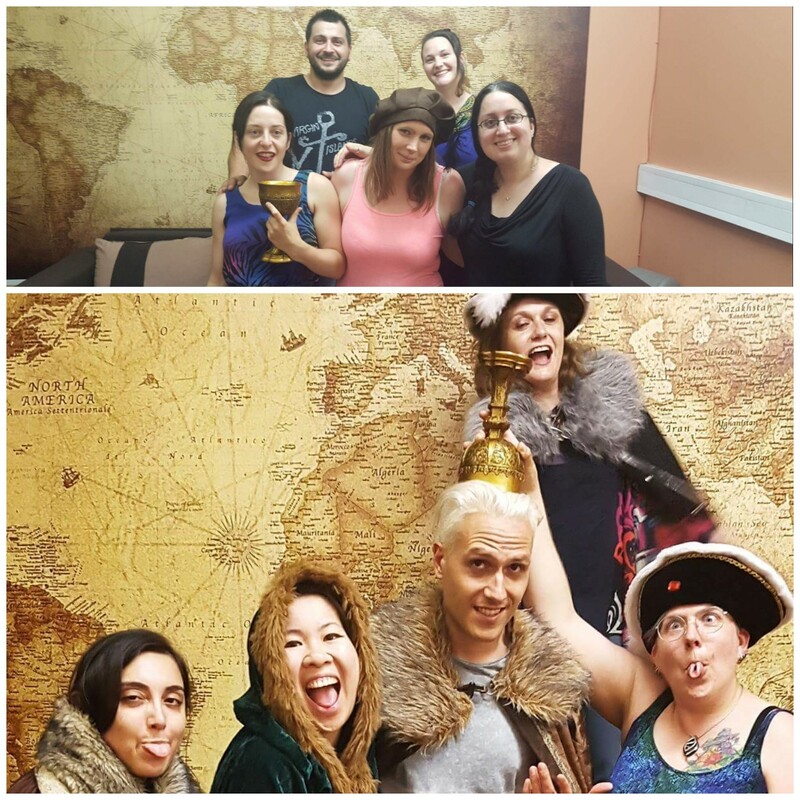 I highly recommend you and your mates/family check out Escape Games London.